Recently, I had the opportunity to take a short sailing on Royal Caribbean’s newest ship – and the largest cruise vessel in the world – Symphony of the Seas. This ship was designed from start to finish with families young and old in mind, and it has delivered on its much-anticipated promise. Here are six reasons I think that Symphony should be your next family vacation. If your family has diverse tastes in ideal ways to spend time onboard a cruise ship, Symphony of the Seas couldn’t be a better choice. Because it is so massive (but not in an overwhelming way where you’re surrounded by crowds constantly, because you’re not! ), there are tons of different activities and amenities to enjoy. Everyone from babies to 90 year olds will be able to find something fun to do. For those that want more action and outdoor fun, Symphony offers a zip line near the aft that soars over the Boardwalk neighborhood. Also at the aft is the Ultimate Abyss slide, which takes riders from deck 16 all the way down to deck 6 in a series of spirals. Want to try out a Royal Caribbean favorite -the FlowRider surfing simulators? You’ll find two of them aboard this particular ship. Staying outside, Symphony also includes a water park with water slides, two rock climbing walls, a mini golf course which looked to be one of the best-designed ones I’ve ever seen on a cruise ship, and a full-sized carousel. Indoors, some fun activities you’ll find include Escape the Rubicon escape room, a laser tag arena, open skating on the ice skating rink, a large arcade, and a huge casino for the adults (seriously, I almost got lost in it!). One thing that I love to see on a cruise ship is a generous amount of dining venues that are included in the cost of the voyage. It’s not that they are absolutely 100 percent necessary, since the foundation of any ship is the main dining room and buffet. But it’s an added perk that guests greatly appreciate these days, and sometimes even contributes to the decision on which ship or cruise line to sail. I’m happy to say that Symphony of the Seas does not disappoint in this area, and it’s a darn good thing because who wants to walk to one lone buffet every day for lunch on the largest cruise ship in the world?! Café Promenade offers coffee, sandwiches, and other bites throughout the day, and Park Café in Central Park serves soups, paninis, wraps, and fruit – some of which is made-to-order and others of which is grab-and-go if you’re in a hurry. The Vitality Café just outside the fitness center offers lighter fare including wraps, fresh fruit, and yogurt. The Solarium Bistro is a buffet restaurant located within the sunny Solarium, and I can confirm that they have a delicious breakfast with nearly as much selection as the Windjammer, and some unique options, too. Crew members at El Loco Fresh up on the sports deck whip up tacos and burritos and there’s a nearby salsa bar to personalize your grub, and don’t forget to stop by the Dog House down on the Boardwalk, which serves up a small menu of specialty hot dogs. Lastly, what Royal Caribbean ship would be complete without a pizza place? We were told that the cruise line upped the ante in their pizza recipes just for Symphony of the Seas, and I’d wager they’re now among the best pies at sea. The entertainment is far from typical on Symphony of the Seas. Ice shows in Studio B feature jaw-dropping projection mapping onto the ice and other high-tech elements that bring the shows to life. Production shows in the main theater are full of extremely talented singers and dancers, who tell a story with a clear, easy to understand storyline. If you’ve been on lots of different cruises, you know how special that is – because some ship shows are just plain confusing! Not the case here. Symphony features the smash-hit musical Hairspray! which is always a favorite among guests, as well as a new show called Flight: Dare to Dream. I had the chance to watch this particular show and let me tell you, it is on another level of entertainment. The Space Station scene seriously had me scratching my head and wondering if I was seeing some kind of hologram instead of a real set with real people on the stage. (Spoiler: it was real!). The story was very heartfelt, and gave a wonderful tribute to pioneers of space at the end that had more than one audience member in tears with a smile on their faces. The AquaTheater show HiRo was also a sight to behold, and I could have watched the performers for half the night. The theme involves samurai and warriors and it was done beautifully, with lots of moments that left the audience gasping in excitement, with a little bit of anxiety and amazement. There’s high-flying acrobatics, synchronized swimming, high-diving, low-diving, and other stunts that are so new to me I wouldn’t even know how to explain them. I’ll just say this: you don’t want to miss that show. 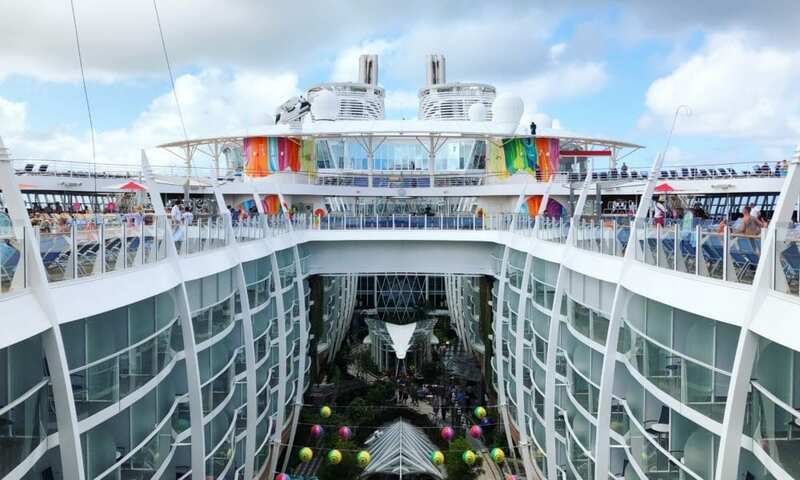 From the minute you board Symphony, you’ll notice that the ship is full of color, abstract murals, modern art in the stairwells, and a smattering of unique sculptures. Every inch of this ship was made for fun and excitement, and Royal Caribbean knows that passengers these days love taking photos of.. well… just about everything. We have no judgment whatsoever, because we, too, are among those passengers! Even in my few short days onboard, I found plenty of colorful, unique spots to take beautiful photos. Some were of me, some were of a friend, and some had no people in the frame at all. If you’re taking a cruise on this ship, take some time one day to just walk around and notice as many works of art as you can. You’ll be surprised by how many you find around every corner! Well, what can we say about this magical place where everyone’s a bit mad there? If you go in with the expectation that nothing will be like a normal restaurant and you truly are in for an unforgettable experience, you just might be at least halfway prepared. Wonderland is – as you probably guessed – based on Alice in Wonderland. The specialty venue is located on several Oasis class ships, but Symphony is actually the first one to have an actor playing the Mad Hatter walking around and interacting with guests. Think of it like a character meal at Disney World, except the food is actually the main show here, not the crazy Hatter! Dinner starts off with a blank piece of paper in a pretty golden frame. It’s your menu. What? Oh yes, you’ve gotta do a little bit of work to see what you’re eating here! The server brings you a little glass of water and a paintbrush, and you have to paint the water onto the paper to make the menu magically appear. That sets the stage for what will be one of the most unique meals of your life. Menu items include Baby Vegetables in the Garden, Oceanic Citrus, Liquid Lobster, Cuban Port Shank, Buffalo Chicken Eggs, and Truffled Egg in the Shell, among other things. Intrigued? You’d better take a seat in Wonderland and see what it’s all about yourself! I’ll just tell you – menu items might sound really wacky, but it was all very delicious. I’m not a hugely adventurous eater and I enjoyed almost everything our table shared. Even though it’s touted as a family ship and certainly that’s the focal point of the show, don’t discount Symphony of the Seas as not being great for couples, because it is. The Central Park neighborhood in particular comes to mind as being a very romantic area with multiple venues that feel very upscale, perfect for celebrating a special occasion or just enjoying a night away from your kids (or the hustle and bustle of everyone else’s kids!). 150 Central Park and Chops Grille are great Central Park date night options, as well as Izumi and Hooked Seafood on the higher decks. For an after-dinner drink, head to Vintages Wine Bar, Copper & Kettle Pub, Dazzles, Boleros Latin Club, or the Rising Tide Bar, which is on a moving platform (it actually rises, get it?). Other favorite spots include the massive Solarium, the Bionic Bar, Spa, Playmaker Sports Bar, or one of the many hot tubs around the ship. Want the ultimate in peace and privacy? Book a balcony cabin facing the ocean, or one of the top suite categories for access to the Coastal Kitchen restaurant, an exclusive lounge, and other amenities depending on the suite class.